My name is Mark Rowley and I just launched EICR Edinburgh in 2015 after successfully running Home System Installations since 2008. I started Home System Installations after my own home renovation was carried out by poor tradesmen, I wanted to install quality electrics safely and efficiently at a fair price. After 7 years I decided I wanted to concentrate on the safety side of electrical work and EICR Edinburgh was born. Worryingly we had been to several installations where an EICR (Electrical installation condition report) had been carried out by a company chosen by the letting agent and given a “pass”. The tenant worried by small electric shocks she had been receiving took advantage of our £45 initial survey offer , and in a short time we had identified many faults before any proper testing associated with an EICR had been carried out. We had to report our findings and help the tenant persuade the landlord to use a registered electrician with experience , and our team quickly resolved the issues. We hold Many qualifications and are insured to £5 million public liability. We are also registered with Select, thus giving you peace of mind you have contacted a properly qualified and registered Electrical Company to carry out your work. 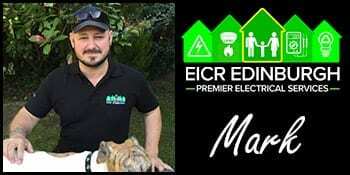 My name is Mark Rowley and I am the Director of EICR Edinburgh. Having received a severe electric shock as an apprentice I take my work very seriously and I understand safety is paramount. At EICR Edinburgh we strive to carry out our testing, repairs and installation work to the highest standard. I served a traditional four year apprenticeship and becoming the youngest qualified at that time, I went on to become an approved electrician, running large jobs to high acclaim in Edinburgh. I have also worked in the Netherlands, Australia, London and Aberdeen on high profile large scale projects completing many before schedule and all on time. I started EICR Edinburgh to deliver a great service at a fair price with the best quality materials and long guarantees, our reviews speak for themselves. I have spent over two decades as an electrician and I am gaining more and more qualification along the way (available on the website). 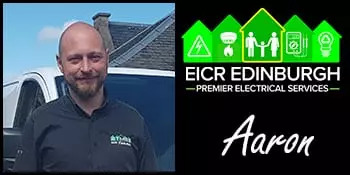 My name is Aaron Macìas Stewart, I joined EICR Edinburgh in 2018, bringing extensive experience in computer networking, data cabling, audio-visual and home automation. I previously operated Aaron Audio-Visual, a company specialising in bespoke domestic solutions, with my designs and installations also featuring in many bars, restaurants and clubs throughout the central belt of Scotland. At EICR Edinburgh we now offer specialist data, telecommunications, computer networking, wireless access, CCTV and home automation services.